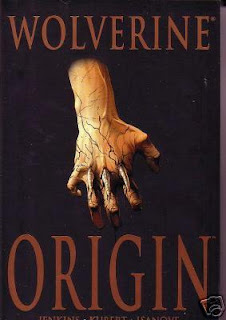 One of the more compelling X-Men is Logan, a.k.a., Wolverine — so much a fan favorite that he merited his own “origins” story earlier this year with Wolverine. He’s the one who had adamantium grafted onto his entire exoskeleton as part of a military experiment, surviving the procedure because his “mutation” enables him to heal and regenerate repeatedly. It makes for a cool Hollywood movie, but surely it has nothing to do with real science, right? Wrong! 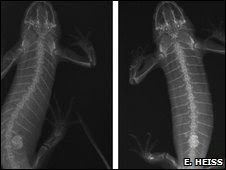 Via io9, we learn that Mother Nature has her own version of Wolverine in the more modest form of the Spanish ribbed newt. As early as 1879, naturalists noticed that the creature could push its rib bones out through the skin to ward off predators. Originally, everyone thought the bones passed through pores in the skin. But a new study using x-ray imaging reveals that the reality is far more gruesome. Zoologist Egon Heiss of the University of Vienna in Austria and colleagues report in the Journal of Zoology that whenever the Spanish ribbed newt becomes agitated by an approaching threat, it swings its ribs forward, expanding the size of its body so much that the ribs literally pierce the skin and stick outside the body, like spines. Once the danger has passed, it retracts the ribs, relying on the well-known ability of newts and other amphibians to repair their skin (some species can even regrow tails). Like Wolverine, they can do this again and again, with no apparent ill effects. It’s even cooler when you recall that in the original origin story for Wolverine, his “claws” weren’t adamantium, but bone, and the process mimicked the Spanish ribbed newt even more closely.